Flanked by Illinois Gov. 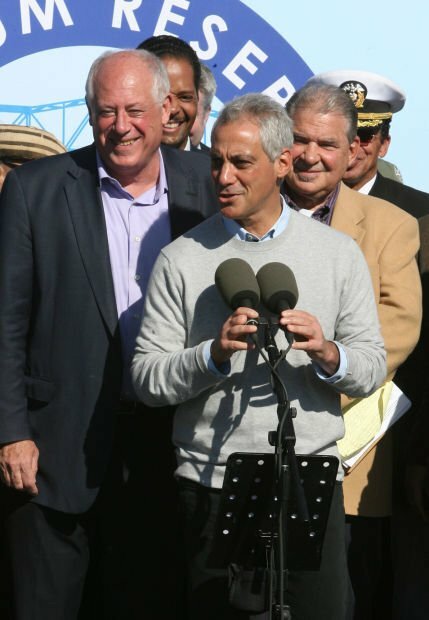 Pat Quinn, left, and Southeast Environmental Task Force President Tom Shepherd, right, Chicago Mayor Rahm Emanuel makes an announcement about access to Lake Calumet. Illinois Gov. Pat Quinn and Chicago Mayor Rahm Emanuel chat following an announcement about access to Lake Calumet. Illinois Gov. Pat Quinn is joined by Chicago Alderman John Pope, left, U.S. Rep. Robin Kelly and Chicago Mayor Rahm Emanuel as they make an announcement about access to Lake Calumet. CHICAGO | Nature put on a spectacular show Saturday as political, environmental and urban planning leaders gathered on the city’s southeast side to announce a major expansion of public recreational access to Lake Calumet. Bright sunshine, cattails swaying in the gentle breeze and flocks of geese honking overhead served as the backdrop for the announcement by Gov. 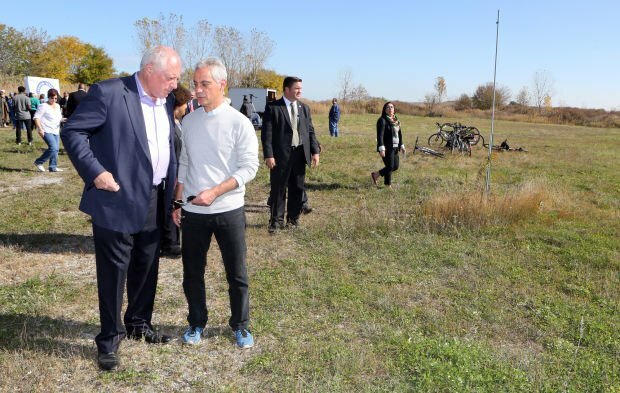 Pat Quinn and Chicago Mayor Rahm Emanuel of an agreement to purchase 282 acres of land from the Illinois International Port District as a recreational area, transforming what was once a dumping ground for slag and industrial waste. Before it was fenced in as a dump site, generations of south side residents grew up roaming this acreage, fishing, hiking, playing and watching bald eagles settle in the trees, said Quinn, including himself in that group. Tom Shepherd, president of the Southeast Environmental Task Force, said he and Quinn first met in 1986 outside the gates of this fenced in area along Doty Avenue to discuss turning the land into a recreational area and nature preserve. The land’s $9 million price tag will be paid with funds from the Open Land Trust, created by Illinois legislators, whom Quinn thanked during the ceremony. Additional money will be needed to develop and maintain the area that will be managed by the Illinois Department of Natural Resources, Quinn said. Emanuel said this recreational area is part of a major movement to create green spaces within the city where families can enjoy nature together. Quinn and Shepherd acknowledged Victor Crivello’s major contributions in acquiring access to Lake Calumet. A Pullman resident, Crivello of the International Port District died in September at age 64. “Vic was one who helped get the ball across the line,” Shepherd said. Dan Stefiuk of Chicago biking company SRAM and a board member of Friends of Big Marsh also attended the announcement. “We’re working on development of the Big Marsh site on the east side of Stony Island,” said Stefiuk of an adjacent area to the Lake Calumet property. Oboi Reed and Jamal Julien co-founded the Slow Roll Chicago earlier this year and joined the celebration. Hammond resident Frank Madeka said connecting regional bike trails is vital. “I can ride from Pulaski Park (on Sheffield Avenue in Hammond) to Buckingham Fountain (on South Columbia Avenue in Chicago) in one hour and 15 minutes on my regular clunker of a bike,” Madeka said. BLOOMINGTON, Ind. — Indiana wildlife officials say a bald eagle introduced to the state 28 years ago may be one of the oldest bald eagles in the U.S.